Interesting and cerebral content. Only wish the entire catalog of back issues were available. I can't imagine not having access this intelligent magazine. DO NOT subscribe to “pocket mag”! Expensive frequent charges, and very difficult to unsubscribe. I was charged a fortune for my “trial”. With so many good magazine and newspaper reader interactive apps to use as models, the Wall Street Journal being a laudable example, there is no excuse for foisting this primitive app on subscribers. What you get is nothing more than a photocopy of the print version that is not even scaled for iPad users. Web link citations are not interactive and if that is not annoying enough, there is no way to cut and paste them into a browser either. I am a big fan of Skeptic Magazine but this app is more annoying than useful. Finally intelligent human beings questioning it all!!! This is one of my favorite magazines. I look forward to each issue and usually read it cover to cover. The Skepdoc is my favorite columnist. Installed app on iPad Pro and it crashes every time I try to open it. Rebooted iPad, but problem with app persists. Sigh. There are gems among magazines, and this is one of them. With material for old and young like, it provides all you need to develop your critical thinking and learn new things. Highly recommended. Excellent app; never had any problems with it, both on my older iPad and on this one, an air 2. 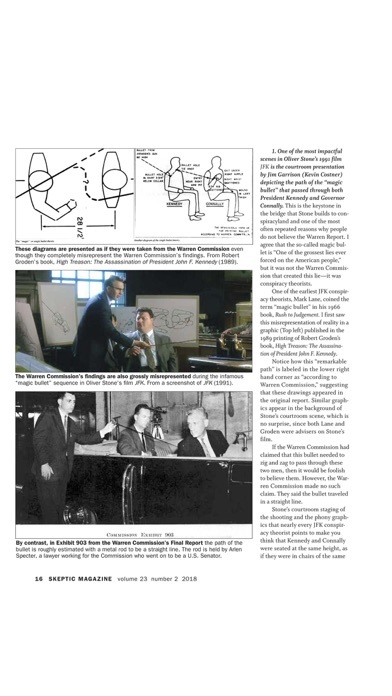 W. News media and late nite talk filled w. Unsupported drive, mass hysteria, skeptical inquirer ties the high road . Bringing rationale, reason, and just common sense, back to the fold of modern man! The nutrition for those still using grey matter for fuel in thinking. This app still crashes when I try to launch it. Fail. The resolution is terrible. The text is blurry even when zoomed out completely. Really bad reading experience. I can't open the app. Please fix. ...I'm hoping to get a refund for the one issue I purchased, then delete this forever. Content didn't download, and even though I got a receipt for my purchase it doesn't show as purchased content in the app. What a crock of, well, you know what! Skeptic Magazine should have been a lot more skeptical about the providers of this app and the content server they selected. The magazine is great -- One of my very favorite. App makes my entire library available whenever and wherever I am. Just open my iPad. I'd like to subscribe but the app crashes on my iPad. This works well enough to read on on the go without ruining your magazine. But there are no features related to text sizing or ability to copy. It's all zoom and pinch baby. Love Skeptic magazine, but this app fails to download issues (gets the first three pages), fails to sync, doesn't work well in landscape mode, etc. Not worth the effort, and surely not the money. Back to print for me. Most frustrating magazine app ever. The content might be good - I still don't know after paying for a subscription. Getting better, but if you want any customer service be skeptical! App constantly crashes upon start up. I've enjoyed Skeptic for a number of years. I travel now so the digital version is much more convenient. While I've not experienced the download problems that many other reviews mention, I find the App itself very primitive. No effort has been expended to scale the content for easy viewing. There is no dictionary, search or annotation support. A PDF viewer would work better than this App. I purchased a subscription yesterday after looking through the free preview. On my iPad the covers do not show and so far I have not been able to even look at the subscribed magazine. All my devices continuously loop in trying to download from the 3rd party (pocketmags). Have not had success to view my PAID subscription on either my iPad 2, iPhone 5, Mac, or my work PC. Nobody has responded to my two email inquiries. I DO NOT RECOMMEND!! Great articles, always on top of the issues! This is still the one magazine I look forward to with eager anticipation. No fluff or filler, just solid science reporting and discussion. Possibly one of the best places for scientific information that is relevant and accessible for the layperson. I really do like the simplicity of this app! It's designed well. It's missing one major thing: bookmarks. I would give this app 5 stars if bookmarks were an option! 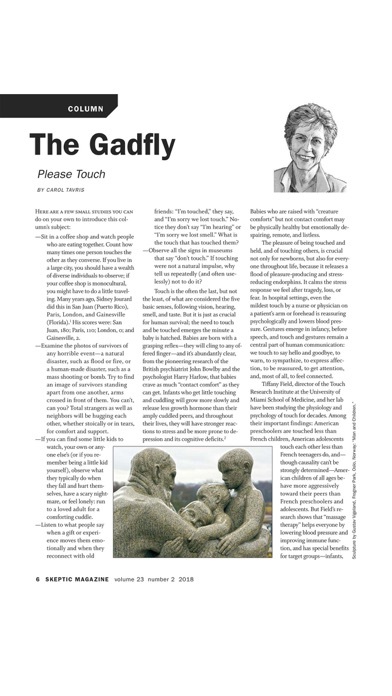 As it is now, I have to take screenshots before leaving the article in order to find where I left off when I return. Not exactly efficient. Thanks!! The app works well on my iPad. The magazine is a great read and I look foreword to each new issue. So far, I like this app, my only complaint is that I'm unable to hold a word and get dictionary definitions. Change that, and I LOVE it. The articles are great, I read them in my phone, tablet and computer. They address current events with a fact based approach and I like that. The app is another thing altogether. Not that great. It makes reading a bit difficult. I have to zoom in and out constantly. give it five stars for content and one star for access. just hangs downloading new issue (Dec?) used to have a mail sub but prefer this. no more $$$ from me until it works! update it folks. Some very dense articles, but well-researched. The interface is pretty good. I like the ability to purchase back issues. Just wish new issues were released more frequently. All I wanted was to be able to read a back issue of this magazine before subscribing to a full year. The 3rd party interface used, called PocketMags, hangs at its splash screen on my iPad (4). I've followed their Help and FAQ which involves deleting the app and reinstalling. Which, of course, didn't work. So, without being able to review one issue before subscribing to year's subscription, I saved myself $11.00, while Skeptic Magazine lost the same. If you're going to sell through the iTunes newsstand, it should work there without any need for 3rd party software. My only complaint, and why it gets 4 stars is that I would like to see more articles per quarter. I understand, however, not wanting to dilute the quality and to be accurate with sourcing and bibliographic information. I highly recommend this for anyone who values reason first and foremost. I am a long-time hard copy Skeptic magazine subscriber. I switched to the e-version to save costs and paper. I have only read one issue so far using my iPad. 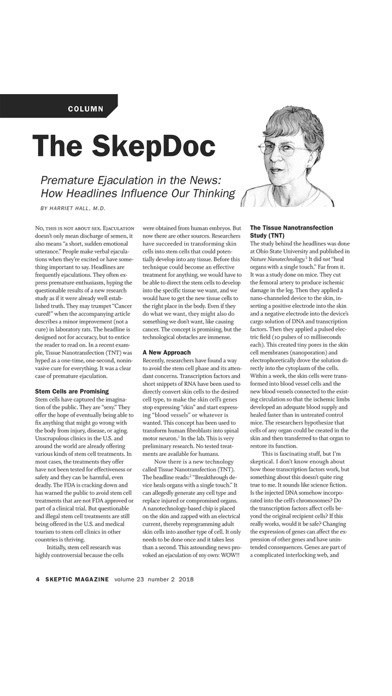 I love the content of Skeptic magazine, but the electronic version is basically a PDF of the magazine. 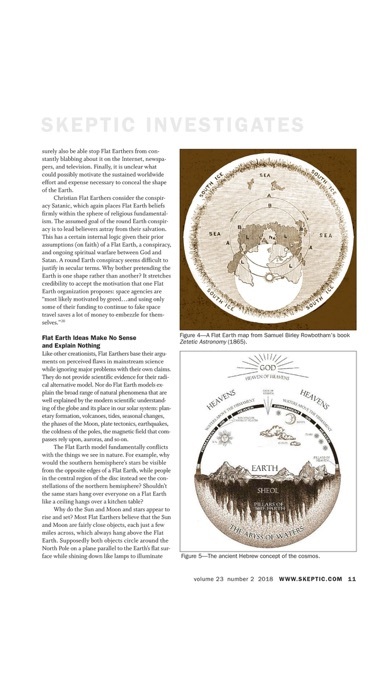 There are no formatting changes to make it easier to read on an iPad (or other tablet) and there are no special features like I am used to getting in other electronic magazines (National Geographic does a awesome job with their electronic version). According to some reviews, people have had problems with their subscriptions. I am anxious to see if I have any problems when the next issue is available. Every problem mentioned here is true. The mag is great so I did not want to give it a one or zero. It's amazing that something like this is even necessary, and it is very much so as this country seems to be devolving into the Dark Ages. How can we have grown so much in the last two thousand years and now seem to be going back to many of the values and superstitions humanity overcame. Science is being devalued, an elite 1 percent of rich people are ruling and the middle class is shrinking, and religion that had evolved more into charitable organizations are now returning to authoritarian attacks on morals and taking over politics. 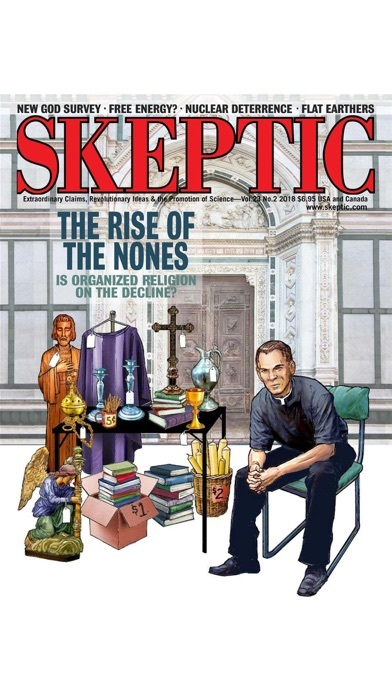 Skeptic Magazine is the antidote for all of that fighting the disease and blight of ignorance and providing a determined resistance to the realities of vaccination deniers, human global warming deniers, charlatans and hucksters, and so much more. I had stacks of Skeptics going back years but now with their availability with a simple App I've replaced the stacks with a subscription and back issues on an iPad. I can now take my library with me wherever I go. Evolution is a good thing. Devolution is stupid. I have an iPad with retina display and the resolution is bad, it looks like a scanned image of the printed page. When they say your one year digital subscription gives you access to back issues, they neglect to mention that you most pay an additional $4.99 for each one. All that you get for your subscription is the current and next three issues. I would not have subscribed if I had recognized this. I have subscribed to Skeptic for more than two years and love the magazine. A few months ago, I subscribed to the e-version. I got one issue to download when I first subscribed, but now I can't get the latest issue to download. The app wants me to pay for the issue or pay for a yearly subscription...again! I use materials from this magazine in the courses that I teach, so I really need to see the latest issue for which I've already paid. I have contacted Pocketmags but so far no response. Skeptic needs to fire that company and get another app provider. I love Skeptic, and the lecture series at Caltech was a special treat when I could make it. The app is nice. Bookmarks and highlighting capability would be nicer. Want to see popular woo debunked? Read this mag! I love the way Skeptic challenges my preconceptions. It offers a wonderful look at commonly held beliefs from an alternative perspective. I'm so glad I subscribe to Skeptic Mag. It's well worth it! I’m glad to have some source material regarding pseudoscience that is not the original claim. There’s a related podcast “Skepticality” which I also enjoy.